For Red Eye Film Festival 2016, each of the twelve student teams from three Mankato schools were prompted with a different genre, character, and object. 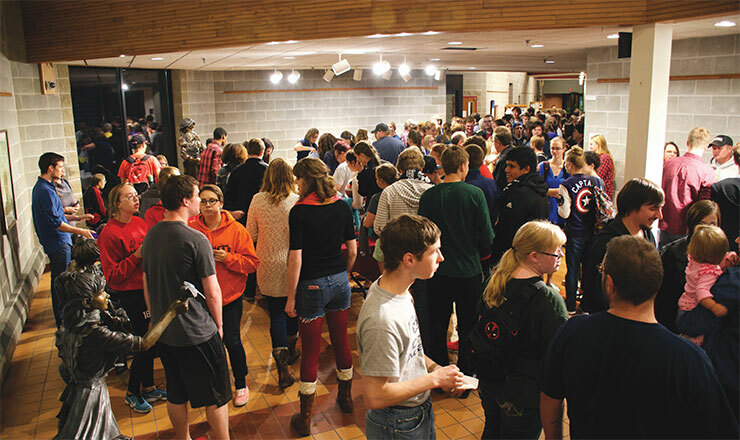 After only a week to complete their films, a large crowd gathered at Bethany Lutheran College for the showcase. It was a year with several laugh-out-loud movies, many surprise endings, and probably more SPAM than audiences expected. It was a strong showing by all three schools. If you missed the showcase, you can watch all of the films online now through KTV’s video on-demand portal. Below is an article on the showcase by student Jasmine Zhang. It was originally published in The Scroll, Bethany Lutheran College’s Student Newspaper. Creativity and professional skills are important in the movie making process. Both of them can be found in the Red Eye Film Festival at Bethany. The Red Eye Film Festival was held on Sept. 26, 2016 by the Media Arts Department in the Ylvisaker Fine Arts Center Theater. This was the 11th year that Red Eye has taken place. Twelve student teams participated from Bethany Lutheran College, South Central College (SCC) and Minnesota State University-Mankato (MSU). Participants were only given one week to brainstorm and shoot the films. Although time was limited, the audience enjoyed all of the films. “Each team was given a unique prompt for their film, which must be a challenge but I think everybody did a good job,” said transfer student (freshman) Hannah Bockoven. Not only did the audience appreciate the films, participants enjoyed the movie making process as well. “We just really want to have a lot of fun with it,” said Sam Shubert, the director of Just Another Origin Story. Just Another Origin Story won the Audience Favorite award and the Judges Choice award. “It was very comical and made me laugh. It was really fun,” said freshman Madison Barber. Red Eye is usually geared towards media arts students. Interestingly, Just Another Origin Story was made by a group of students from different majors. While Shubert studies media arts, the other team members study biology, theater, and communication . The runner up for Audience Favorite was Reminiscence, a tragedy shot by a group of students from South Central College. “It is good practice to make films under pressure and work with a team that you are not used to,” said Reva Strunk, the producer of Reminiscence. Red Eye is a good chance to learn not only interpersonal skills but also professional filmmaking skills. The third place film for Audience Favorite was Fugazi, which was also made by a group of South Central College students. Amanda Anez, the producer of Fugazi, said that Red Eye was definitely a learning experience. “Many members of my team had little to no experience with producing videos before but everyone did a great job jumping in and learning,” she said. Every participant enjoyed the process and the best reward was a successful audience screening. However, every group met some difficulties during the movie making process. Seth Grabow, Bethany’s production studio specialist, said that Red Eye is a good chance for students to really show off what they are capable of. “Students like that freedom and pressure and their friends and family love to come and watch what they come up with,” said Grabow. For those who missed the film showcase, you can watch online through KTV, Mankato Community Television.